…but He can still survive! You can never put a good man down! Low rating wasn’t Jaejoong’s problem but the drama itself. Hyun Bin is one of Korea’s most loved actors but he had a low rating in his first drama after military discharge and his co-star was freaking Han Ji Min. I refuse to link JJ to the low rating of Manhole because nomatter who’s the actor that drama would have a bad rating it wasn’t really a well written drama. So true all through out the intertwining stories, the acting of Kim Jaejoong and some of its casts really shine through. Kudos to all!!! yes i love and agree with all of your opinions and i love what the naver site said. it is a complex thing these ratings and don’t accurately reflect the dramas strong points. JJ has proved he can carry a drama even with all the challenges it presents and that is what a good actor does. i love his spirit and love of acting! He is a success no matter what the ratings or soothsayers say. OMG 2% , JJ predicted 15% at the 1 st episode. He must just read the story line to agree to act, not knowing the writers lost it as the story went on. No matter what, Jaejoong is an excellent actor for sure now. He didn’t get lost after MS. I totally agreed with you. Manhole did not get the attention of what it deserves of all along. To me, Manhole is a superb production. I don’t know why the SK audience are so sacarstic of criticizing this and that. For me, Manhole is enyoyable to watch. If one can forget about the so-called logic of the story and sit down quietly to watch and follow the footsteps with Bong Pil throughout the episodes, they will soon find that this is actually a very enyoyable, inspiring and heart touching drama to watch. Jaejoong really did a very hard but gorgeous job of interpreting the character of Bong Pil. Manhole should be known by much more people in the world. If SK people could not appreciate this, well, let the overseas audience do this. I hope the Japanese audience could appreciate the fun and heart touching themes that Bong Pil has brought in this drama, and then draw the attention of the audience in other Asian countries. And most important of all, I hope Jaejoong’s acting skills could be recognized and rewarded in someway. I read a lot of tweets from non-fans who are enjoying Manhole, maybe because they don’t have bias or prejudice towards a certain actor or actress. Some Jaejoong fansites admins are retweeting inspiring comments about the drama and its heartwarming to read positive feedbacks from non-fans in contrasts to harsh comments coming from other fans. Well, to each his own. To those who enjoy the drama, let’s continue promoting it in our own little way. from kdrama fairy @kdramafairy with 28.5K followers, isn’t it a kind or promotion? They already gave up the drama from the first epsd.That sound so strange and fishy,is’nt it? it was all planed.. I keep thinking that way.. Hopefully JJ nominate in this year kbs award,feeling disapointed he dindt get any at 2015(spy), wish that year he win best couple with ko sung he T__T but it just in my dream..
Had I not been a Jaejoong fan, I would have still given this drama a chance. The storyline was interesting to me and JJ and the cast kept my interest from the first episode to the end. I hope we will continue to see more of JJ in dramas that are out of the norm. I’d be honest and say the drama started pretty good and ended good but the storyline of 8 or 9 episodes between the start and the end was poor I couldn’t enjoy them at all. However I give my thumbs up for “MOST” of the actors, director and Jaejoong’s stylist. the big positive thing about manhole is that it offered Jaejoong a chance to show more of his acting potentiel that we didn’t see before. I checked KBS drama ratings many has 5% or 6% which is still low, I belive manhole doesn’t deserve rating as low as 2% ~~ 3% but I don’t think it was a catchy drama either. the drama before Manhole wasn’t doing good in rating, UEE had lies scandals made her being hated by koreans just few weeks before the start of the drama and KBS gave Manhole zero promtions in their TV programs so in my opinion even before the start, Manhole didn’t have big chances to win ratings that’s why it startded low before we even knew what was it about, it’s just that writer made it even worse when he was the only one able to break the curse manhole started with. rating aside, I believe Manhole could’ve been a better drama if the writer have worked on making it more intense since the first episodes and the lead actress was better at acting. For Jaejoong, I say you worked hard and your acting was great and that’s what matters the most for you as an actor, fortunately, thanks to you the drama was sold to Japan for 150 million / episode breaking descendant of the sun record (100 million / episode) and becoming the highest selling drama ever so thankfully all actors will be well paid ^^ $$$ is what matters for producers and broadcast channels and great acting is what matters for writers and directors you got them both, as someone from the staff wrote in his instagram picture with Jaejoong, “Fly to a better drama” I’m looking forward to it. I’m going to be a bit of a grouch. I think jaejoong did a terrific job but that script was a mess. It had an incredible amount of potential and was a unique concept, but it just didn’t make it. The ratings should have been better but people didn’t connect with it. JJ worked his tush off and showed his acting capabilities have continued to grow, but even he couldn’t save it. Hope I didn’t offend anyone, but I don’t think that ANY actor could have gotten better ratings with this material. So, I will happily wait for his next project! I am sorry I can’t agree with you. I don’t think the script is that bad, so bad that it could just worth 2% audience rate. Though the script may not be a very perfect one, it does occasionally presents interesting idea. The only episodes that might have dragging a bit long are episode 11-13 only. Other than that, majority of the drama is above average and enjoyable to watch. I myself totally understand of what is going on in the lines of the story, and actually most of the time felt impressed by the way Jaejoong is interpreting Bong Pil’s character. Many of the scenes are beautiful shot either. I completely agree that it didn’t deserve a 2% ratings, but it was not consistently so well written that it managed to pull in an audience. Fight My Way started with a small core of followers but quickly grew to respectable numbers. A script that is “not half bad” also is one that has gaps and may miss its target audience.While the idea was very good, the execution of the script (it’s pacing, perhaps? Failure to write dialog that pulled in the viewer?) Something was just not clicking with people. JJ absolutely did his best and his interpretation of Bong Pil was spot on, but someplace there was a “failure to connect”. I’ll be blunt: UEE did not connect with the watchers much. Her vapid and lackluster character in the script made it much less than it could have been. Kudos to Jaejoong for his part, but this was a sigh-what could have been-drama for many. Having said that, it was a major positive for JJ and his career so it’s all good in my book! I don’t see the script is such a big problem. Some people are just trying to “pick bones from an egg” in respect of this drama I don’t know why. In this drama, there is good enough for you to inspire and appreciate and feel touched by just watching Bong Pil alone! I bet people can’t appreciate the storyline is because they do not follow the journey of Bong Pil closely enough and instead skipping through the episodes without seeing the details. I think for Manhole, one will easily feel lost where it is up to if you just skip through the episodes, because it is a time slip story and Bong Pil is traveling here and there in time and come back with everything reset. 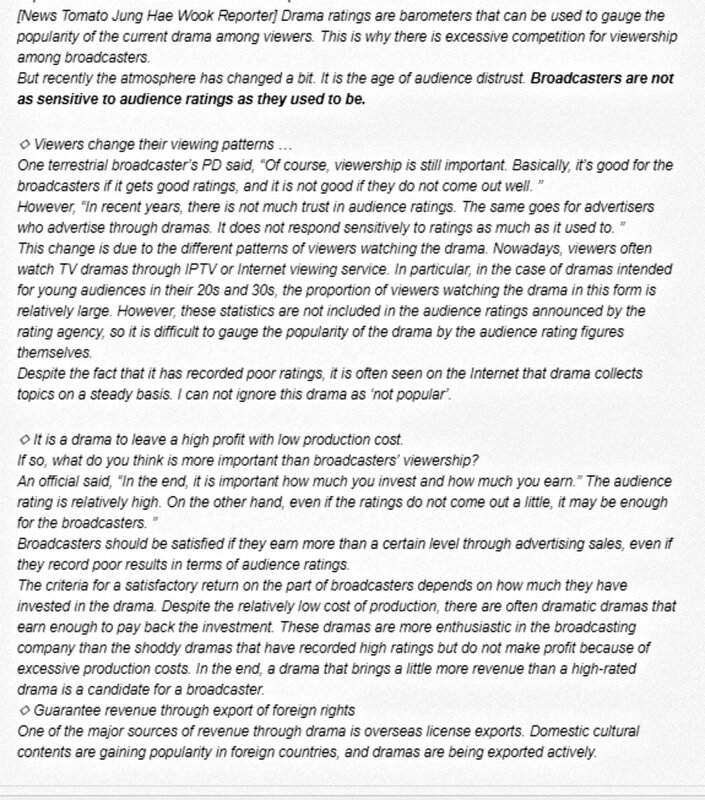 So the problem is the way nowadays audience are watching drama. I am no specialist in production of drama so I won’t comment the script that much. I am just an audience, as far as a drama is enjoyable to watch, lines are sufficiently clear presented, acting skills are good, scene are beautifully shot, audience’s emotions are being caught, what do you, as an audience, still want to ask for? good answer i think like this too. also for me there was too much self talk to explain the situations. it was hard to figure out why things were happening the way they were until you were 15 minutes into it. The ratings were meh but his acting was not!